The only ring I have ever worn is my wedding band. And for a guy who does not like to wear rings, I was amazingly picky about that one too. I do not wear gold, can’t wear silver, and I do not like to be flashy. My wedding band is platinum and about as basic as it can be. But recently I have been turned on to steel and tungsten jewelry and came across a company that may lure me into wearing rings. I found Men’s Tungsten Online, an online retailer of.....wait for it....Men’s jewelry made of tungsten. If I were to start a jewelry company, it would be this one. I swear the founder was thinking of people like me when he started MensTungstenOnline.com. Even the name isn’t flashy! 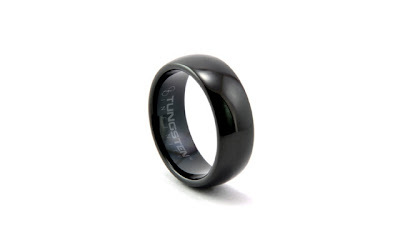 Men’s Tungsten Online offers basic, but not boring rings, for men made exclusively of tungsten. I am attracted to the entire line as there is not a gaudy one in the lot, but my favorite ring is the Mars men's band from the Black line, which is simple and understated, yet beautiful at the same time. Men’s Tungsten Online also specializes in engraving tungsten rings, which would turn any ring into a keepsake. The price for tungsten is a fraction of gold and platinum, yet it is just as beautiful and will last forever. Tungsten is one of the hardest metals that exist. Kudos Men’s Tungsten Online, you may have converted me into a run wearer!